So how exactly does one go about sharpening a ceramic knife? Many people have ceramic knives in their kitchen, the reason for buying one in the first place is that ceramic is such a hard material. These knives last a long time. However, although ceramic blades do last longer than steel knives, there does come a point when your knife will need some TLC. Having said that, a ceramic knife used carefully and in the proper manner can last many months of continuous use before it needs sharpening. We have included some videos below as a guide on how to sharpen a ceramic knife, however firstly you will need the correct knife-sharpening tool in order to restore your ceramic knife-edge. The fact is there are only a few electric sharpeners that are specifically designed to sharpen ceramic knives. 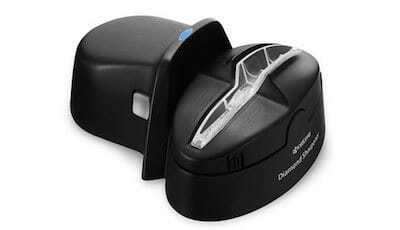 For this task, the Kyocera Electric Diamond Ceramic Knife Sharpener (DS-50); comes highly recommended. Manual sharpening rods are not recommended for the sharpening of ceramic blades, as most are not up to the task. Ceramic is such a hard material that an inferior sharpening rod will just end up damaging your blade rather than restoring it. 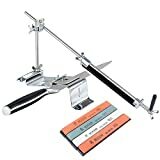 If you wish to use a sharpening rod, this 7-Inch Diamond Knife Sharpener Steel Oval Shaft rod is designed specifically for use on ceramic knives. Being hard and brittle ceramic knives can chip all to easily. It is not recommended that you use a whetstone sharpeners unless you know what you are doing. A 2000 grit can be used to sharpen small marks on the blade, and then fine tune with a 6000 / 8000 grit whetstone. If your ceramic knife has larger indentations along the blade, you may have to consult a professional knife sharpener in order to carry out the repair. Also, remember that many manufacturers of ceramic knives offer warranties. Find out how long yours is. If your blade is giving a lackluster performance and is still under warranty you will be able to send it back to the manufacturer and have it factory sharpened; one of the best and most cost effective way to sharpen a ceramic knife. Unfortunately many people end up buying a ‘ceramic knife sharpener’ thinking they are designed for the sharpening of ceramic knives. This is a common misconception. The fact is, a ceramic knife sharpener is mostly one that has sharpening abrasives made from ceramic. They are designed for steel knives. 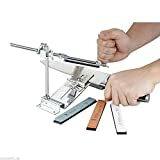 When shopping for a knife sharpener for your ceramic tools, you need to ensure the sharpener is designed FOR ceramic knives, not made out of ceramic. Like all tools in the kitchen, you need to make sure they are clean and safe to use. Hygiene and safety are the two main issues in any kitchen, at home or in a restaurant. The great thing about ceramic knives is that they are easy to keep clean. Food does not stick to the ceramic material, meaning they can be cleaned with soap and water and wiped. Ceramic knives must not be placed into a dishwasher however. Doing so could risk chipping them. That’s the last thing you will want to do if you have invested in an expensive set of ceramic knives. Using a ceramic knife is just the same as with any other. You need to be careful of the blade and ensure to slice to the speed of your experience level. However, bare in mind that ‘slice’ is the operative word here. 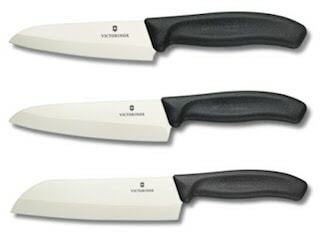 Ceramic knives are designed for slicing, you should not chop, carve or use for any other forced cutting. If you are too heavy handed with a ceramic knife the blade can snap. A splinter of ceramic knife in your hand is something you will want to avoid. When slicing with a ceramic knife, apply only moderate pressure. If you need to force the cut then you are using the wrong tool, and should pick up a steel knife instead. Do not use a ceramic knife against a hard surface, (they should be used against a plastic or wooden chopping board only). Never use a ceramic knife on hard foods – hard cheese, potatoes, these are out as far as your ceramic tools go. If you have a ceramic knife set it is worth purchasing a bamboo knife block. This is the safest way to store ceramic knives and to ensure that they don’t get damaged. If you simply store your ceramic knives in a draw along side other knives you risk them being chipped and damaged. This will in turn decrease their life span meaning you will need to sharpen them all the more regularly. Although ceramic knives are extremely hard, sharp one of their downfalls is that the material is brittle. If you drop your ceramic knife there is a very real chance a tiny piece will chip and break off. If your knife falls from any distance it could break into several pieces. You can understand why the careful storage of your knife is very important.